Spicy meat patties with potatoes are so flavorful, easy and satisfying. Two ways to make the recipe – broiling and traditional shallow frying. 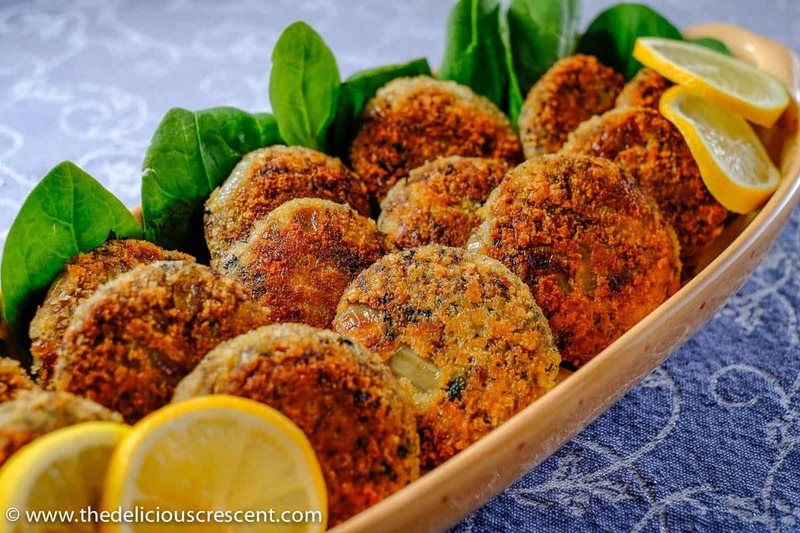 There are different versions of this preparation around the world and they are known by a variety of names – croquettes, kebabs, cutlet, kotlet and such. Here I am discussing a middle eastern version. The other kinds may differ in the amounts and types of spices/herbs added and cooking methods. The main ingredients here are lean beef and potatoes, with the flavor profile being significantly boosted with a variety of spices and herbs. I have previously discussed about beef in my post on Kofta Kebab Masala. Potatoes are a versatile, ubiquitous and much preferred vegetable. A tuberous crop, it is a rich source of potassium and therefore helps with blood pressure regulation. The content of vitamin C, vitamin B-6, fiber, potassium and zero cholesterol make it heart healthy. Potatoes are also a good source of some minerals and phytochemicals. I prefer buying organic potatoes and typically cook it with the peel. This prevents the loss of good nutrients. Potatoes are well known for the carbohydrate content. And it is mainly in the form of complex carbohydrates, which are certainly preferred over simple sugars. However, those with diabetes should monitor the intake of potatoes as part of carbohydrate counting. Potatoes also have a small but significant percentage of resistant starch which is considered to have similar health benefits as fiber. And it also contributes to satiety. There are several spices used here. But in particular, I will mention about Turmeric. This spice is widely used in the Middle east, southeast Asia, and North Africa. Curcumin, the biologically active polyphenol in turmeric, has potent anti-inflammatory and antioxidant properties. And it is thought that this may contribute to it’s potential to prevent cancer, Alzheimer disease, heart disease, arthritis, and such. 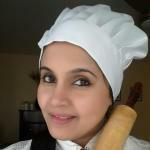 Some other flavor packed recipes on this blog that use a lot of spices are Easy Hyderabadi Chicken Biryani, Kofta Kebab Masala and Eggs in Spicy and Saucy Tomato Curry. Below I have listed the broiled and shallow fried variations. What is a better choice? It depends on what else is on the menu. If it is served with boiled rice and a light gravy dish; then couple of shallow fried patties can be fine. But if it is part of a sandwich with any other rich condiments or ingredients, then certainly choose the broiled version. And you will absolutely not be able to tell the difference. They are pretty tasty too. 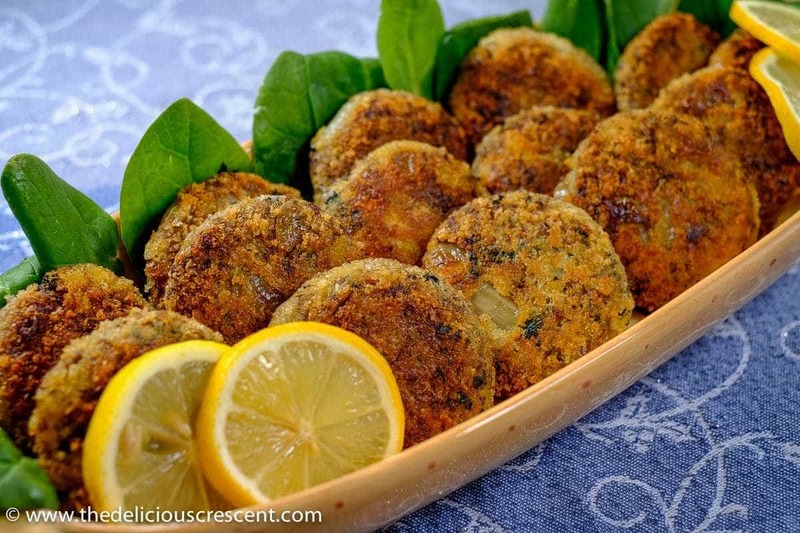 The panko bread crumbs ensure a crisp exterior on broiling. The bonus is that these spicy meat patties with potatoes freeze beautifully. Just take them out when you need, thaw and broil or shallow fry as you wish. Spicy meat patties with potatoes are so flavorful, easy and satisfying. Two ways to make the recipe - broiling and traditional shallow frying. Heat the oil in a cooking pot and add the chopped onion and sauté until it has softened. Add the ground meat and stir while letting the juices evaporate. Add all the spices and mix. And let it cook on a low flame until the meat is well done. Add the salt and herbs and mix well. And let it cool to room temperature. Crush the potatoes and add to the meat mixture. Mix very well. The mixture should feel like dough and easily moldable. You may prefer to divide the mixture into 24 portions. Roll each portion into a ball shape and then flatten it into a disc. Set the shaped meat mixture aside. Set up the items for breading the patties. Beat the egg (I actually beat two eggs, and half of that was remaining at the end). Spread the bread crumbs in a flat plate. Dip each patty in the beaten egg and then dip it in the bread crumbs, making sure to coat all around in each step. Press the patty gently to make sure the bread crumbs are nicely set on it. Keep the prepared patties aside. The patties can be broiled at high, about two to three minutes on each side. Prior to broiling, spray some olive oil on both sides of the patties using a oil sprayer. The time needed to broil to a golden brown may differ with each oven. Check after two minutes for each side and broil further as needed. The patties may be shallow fried in three batches in a skillet that has enough room for eight patties. For each batch, heat 3 tablespoons oil in the skillet on medium high. Once the oil is hot enough, slide eight patties and lower the heat to medium and shallow fry both sides for 2 minutes each until golden brown. Once done, transfer to a plate lined with paper towels. 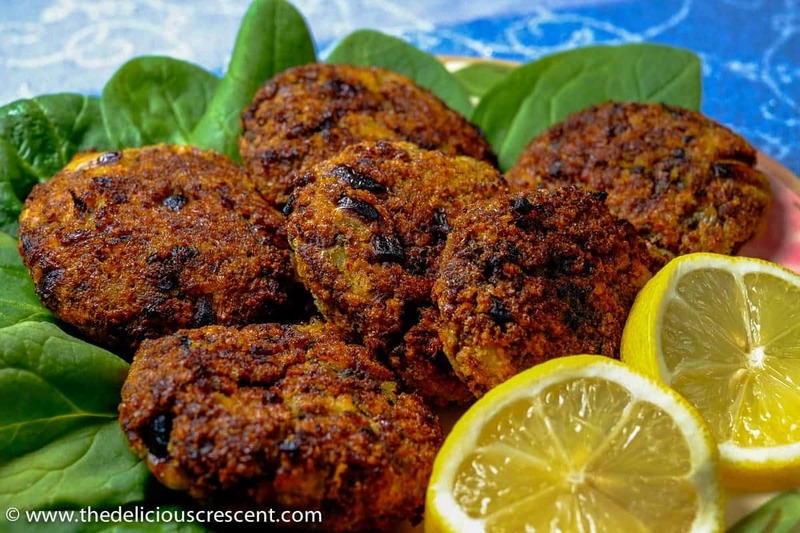 Serve the patties in a platter lined with some greens such as spinach or lettuce and some lime slices. May serve the patties as an appetizer, side dish, snack or they can be used to make sandwiches. If the frying is done right at the optimum temperature and if not reusing the same oil, the absorption of oil can be kept to the minimum. The patties can be breaded and frozen a day ahead. Prior to broiling or frying, thaw the patties. Frozen patties can also be kept for a longer time for later use, especially in freezers that do not form ice crystals on the patties.